A few weeks ago I did a small roundup of modern rocking chairs to accompany a decor story in the Boston Globe. (Every Monday my lovely colleague Jaci Conroy writes an interior design article for the Globe and I pull together a corresponding group of furnishings & accessories.) I found so many great modern rocking chairs + contemporary rocking chairs that I figured a blog post was in order. These all have great styling and are a far departure from traditional rockers or overstuffed gliders for the nursery. We have an Eames molded plastic rocker in sky blue on the Cape that we bought for my son, though I think it’s in our room now. Sometimes I use it on our little deck. I didn’t include that iconic example here, but there are other examples (mid-century modern furniture replicas), like the #16, the Swerve which has jaunty cut-outs and a full wooden base. I love the look of #5, a very spare rocker from NYC shop Matter, and of love the tall mint-upholstered one by Normann Copenhagen. 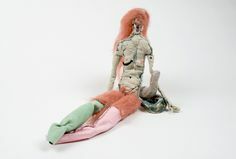 And if only I could place that blush colored Artifort rocker in the model apartment I’m decorating. Probably thought, the one that makes the most sense for my lifestyle is Gus Modern’s GT rocker (#13). It is definitely a contemporary rocking chair in style, but with enough cushion to be comfy. Shop 30 modern rocking chairs from StyleCarrot partners and other favorite shops. 1 Comback Rocking Chair by Patricia Urquiola for Kartell, $890 at YLiving. 2 Taxed Rocking Chair by Segis, $1,309.99 at AllModern. 3 First Rocking Chair, $3,170 at Matter. 4 Buttercup Rocker by Blu Dot, $899 at Lumens. 5 Era Rocking Chair by Normann Copenhagen & Simon Legald, $1,860 at A+R. 6 Terra Rocking Chair by Antonio Forteleoni for ATIPIC, $1,172 at AllModern. 7 Outback II Rocking Chair, $329 at CB2. 8 Hand-Woven Rocker, $299 at Urban Outfitters. 9 Geneva Wood Patio Rocking Chair by Safavieh, $216 at Target. 10 500 Series Rocking Chair by Artifort, $4,006 at YLiving. 11 Stingray Rocker by Thomas Pedersen, $4,537 at Danish Design Store. 12 Luxembourg Rocking Chair by Fermob, $1,024 at Horne. 13 GT Rocker by Gus Modern, $1,150 at 2modern. 14 Rapson Rocker by Ralph Rapson for Loll Designs, $1,159 at YLiving. 15 Aquios Bentwood Rocking Chair by CorLiving, $102.05 at Overstock. 16 Swerve Rocking Chair by Modway, $299 at IFN Modern. 17 Regatta Rocking Chair, $499 at Crate & Barrel. 18 POÄNG Rocking Chair, $169 at Ikea. 19 Risom Rocker, $2,470 at DWR. 20 Version 5 Rocker by A. Jacob Marks for Skram, $5,302 at Lumens. 21 Voido Rocking Chair by Ron Arad for Magis, $985 at YLiving. 22 Mod RockerBy Iglooplay, $326 at 2modern. 23 Mid-Century Rocking Chair, $599 at Land of Nod. 24 Mod Lounger by Lisa Albin for OFFI, $599 at YLiving. 25 Rocker Chair by Guidecraft, $109.95 at AllModern. 26 Sleepytime Rocker by Nursery Works, $499 at YLiving. 27 Rapson Greenbelt Rocker with Arms by Ralph Rapson, $1,695 at YLiving. 28 Wicker & Chrome Mid-Century Rocking Chair, $850 at Chairish. 29 Springwood Rocking Chair, $799 at Land of Nod. 30 Mademoiselle Rocking Chair by Artek, $1,538 at 2modern. 31 Windsorrondack Single Rocker by Board by Design, $4,100 at Aha Life. 32 Rocking Chair in Scrapwood by Piet Hein Eek, $921 at The Future Perfect. 33 Rocking Chair by Adrian Pearsall,$3,000 at Azalea Modern, 1stdibs. 34 Upholstered Mid Century Rocking Chair, $281.71 at shopladder, eBay. 35 Rocking Bent Wood Chairs, $1,875 at S.Julian, 1stdibs. 36 Do Do Rocking Chair by Jean-Marie Massaud for Poltrona Frau at Switch Modern. This Sunday was the last 2014 Boston Globe Magazine home decor issue. The theme was “Make It Your Own.” I wrote a several features for it (I will blog about La Tartine Gourmande blogger Bea Peltre’s colorful home soon and well as a South End condo with industrial style decor.) They’re two of my all time favorite spaces about which I’ve written. 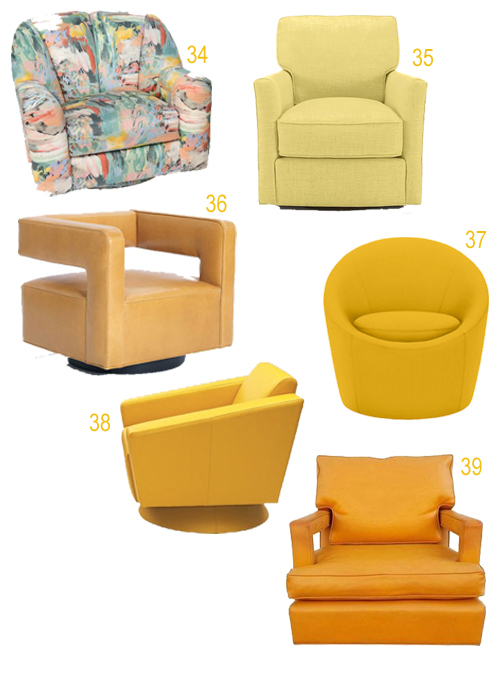 Here are 45 upholstered swivel chairs in every color as well as some patterns from StyleCarrot partners and others. 1 Eos Swivel Chair, $999 at Room & Board. 2 Willy Swivel Armchair by Poltrona Frau at Switch Modern. 3 Alfosa Cow Print Swivel Chair, $278.54 at Wayfair. 4 Blakely Brown Swivel Chair, $480 at Bellacor. 5 Agathos Swivel Armchair by Antonio Citterio at Switch Modern. 6 Sutton Chevron Swivel Chairi, $499.99 at Bellacor. 7 Manhattan Swivel Stool, $986 at Seagrass Home. 8 Baxter Swivel Chair, $2,595 at Jonathan Adler. 9 Lazar Scroll Corkscrew Left Swivel Chair, $806 at AllModern. 10 Felix Chair by Mitchell Gold+Bob Williams, $2,115 at Bloomingdale’s. 11 Felix Swivel Chair, $1,545 at Mitchell Gold + Bob Williams. 12 Penta Swivel Chair by Viccarbe, $1,697 at Switch Modern. 13 Hugo Swivel Chair, $999 at Room & Board. 14 Feelin’ Groovy Swivel Chairs at Thayer Coggin. 15 Rothko Swivel Chair, $799.95 at Boston Interiors. 16 Milo Baughman Style Barrel Chairs, $895/pair at Chairish. 17 Duffield Swivel Chair in Brushstrokes, $799 at West Elm. 18 Duffield Swivel Chair in Ikat Chevron, $799 at West Elm. 19 Floral Arm Chair, $1,900 at 1st Dibs. 20 Luxe Slipcovered Swivel Chair, $1,299 at Crate & Barrel. 21 Azimut Swivel Chair by Marco Fumagalli at Roche Bobois. 22 Anda Swivel Chair at Ligne Roset. 23 Reid Swivel Armchair, $2,720 at DWR. 24 Brisbane in Sunbrella Canvas, $1,299 at Room & Board. 25 Swivel Ottoman at Ligne Roset. 26 Celeste Swivel Chair, $749 at Room & Board. 27 Axis II Leather Swivel Chair, $1,899 at Crate & Barrel. 28 Serene Slipcovered Swivel Chair, $1,499 at Crate & Barrel. 29 Linda Swivel Chair, $799 at Circle Furniture. 30 Anda Swivel Chair at Ligne Roset. 31 Morgan Track Arm Swivel Glider, $1,089 at Ethan Allen. 32 Colby Swivel Club Chair by Elegant Home Fashions, $496 at Bellacor. 33 Stockholm Swivel Chair, $399 at IKEA. 34 1980s Directional Swivel Lounge Chair, $3,850 at 1st Dibs. 35 Talia Swivel Chair, $1,399 at Crate & Barrel. 36 Nico Return Leather Swivel Chair, $2,545 at Mitchell Gold + Bob Williams. 37 Crest Swivel Chair in Sunbrella Canvas, $799 at Room & Board. 38 Modern Swivel Chair 805, $953 at Contemporary Furniture. 39 Mid-Century Custom Swivel Arm Chairs, $2,850/pair at Chairish. 40 Pumpkin Chair by Pierre Paulin at Ligne Roset. 41 Facett Swivel Armchair at Ligne Roset. 42 Fresco Swivel Occasional Chair at LaZBoy. 43 Otis Swivel Chair, $699 at Room & Board. 44 Barrel Back Swivel Lounge Chair, $2,850/pair at 1st Dibs. 45 Hathaway Swivel Glicer, $1,099 at Crate & Barrel.